Graduating UBC Journalism student Ryan Patrick Jones has been awarded the Joan Donaldson CBC News Scholarship. He will be working full-time for CBC News this summer, with stints in Toronto, Ottawa, and Yellowknife. The paid four-month internships are among the most prestigious for Canadian journalism students. The public broadcaster offers eight scholarships annually to 11 participating schools. “Ryan is a news hound,” said Kathryn Gretsinger, senior instructor at the School of Journalism. Jones has worked as a web writer for the past year in CBC’s newsrooms in Toronto and Vancouver, covering a range of issues from breaking news to political affairs. 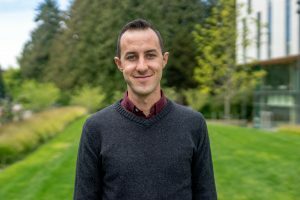 He is also an alumni of UBC Journalism’s Reporting in Indigenous Communities course and a student in the International Reporting Program, which took him to fishing ports in Guangdong, China in December 2018. His work at UBC’s community radio station CiTR was recognized with a National Community Radio Award for best news reporting in 2018. Previously, Jones graduated with a BA in political science and history from the University of Ottawa in 2012 and spent five years living in Taiwan. Donaldson scholarship recipients get hands-on experience in CBC’s web, radio and TV operations. They work behind the scenes, on air, or a combination of both. Jones will start work in Toronto and then head to Ottawa to work on the television show Power & Politics. In June he’ll join CBC in Yellowknife, before finishing up the summer at Here and Now in Toronto. “I’m really excited for the opportunity to do different kinds of journalism in parts of the newsroom where I haven’t worked before,” said Jones. On choosing a placement in Yellowknife, Jones said he wanted to challenge himself. “I wanted to do something outside the box that I normally wouldn’t do and probably won’t have the opportunity to do in the future … Another reason is because I wanted to work in a smaller newsroom so I have the opportunity to take on as many different roles as possible,” he said. The scholarship was founded in 1999 and honours Joan Donaldson, the founding head of CBC Newsworld, now CBC News Network. Recipients are chosen for their academic performance and commitment to public service journalism. Last year, three UBC Journalism students were awarded the scholarship in a UBC first. They are Haley Lewis, Malone Mullin and Kirthana Sasitharan. Past recipients have landed permanent jobs at CBC, including alumni Peggy Lam, Michelle Ghoussoub and Lien Yeung, who continue to work for the broadcaster.